Today I am pairing up with Sabai Soaps to create an awareness and infuormative post on Eczema. As I suffer extremely badly with eczema I thought this would be the perfect opportunity to share my story of how long I have had eczema for and how I treat it, or at least try to treat it. In this post we have also included some information from skin experts themselves who were willing to share their thoughts. I have had eczema since I was born, along with horrible dry skin. I remember when I was little I'd have to bath with different creams and ointments with the help of my mum and then once I was dry, I'd stand on the kitchen chair and my mum would then cover me with a thick cream for eczema. However, no matter how many times we did this during the week my eczema would not clear. I eventually went to see someone about my skin and they provided me with a heck load of different creams for eczema and some made my skin really sore and then there were the ones which I had a reaction too. Throughout the past few years I have started using steroid creams which have been prescribed by my doctors. The first one they gave me was for children so it did not work on my skin, but the second one was for adults and at the time I was still in school so this was far too harsh on my skin and it made it sting. I finally found a steroid cream which made my eczema disappear but they wouldn't let me use it all of the time, for obvious reasons! It's a steroid cream. Unfortunately, I was then unable to get this cream anyway because they stopped making it. One product I am currently trying is Mangosteen Soap for my hands! I am unable to use the standard soap which you can buy from supermarkets as it always makes my eczema so much worse but so far so good with the Handmade soap from Sabai Soaps. My advice for anyone who has eczema, keep trying to find a product which helps for you! I haven't found that perfect product for me yet, but I know there is still hope! As well as this, do not scratch your eczema, no matter how itchy it is! I need to take this advice too as I scratch my eczema till the point its lumpy and bleeding which makes it even more sore! Eczema is a skin condition which is basically redness, itching, small pimples and bumps on your skin. Sometimes Eczema also leads to scaly skin and sometimes very cracked skin too. Another term for Eczema is atopic dermatitis ( I never knew this until now). No one exactly knows what the cause of Eczema is as it's so varied, however they do try absolutely everything to find out which causes yours. Your genetic history is believed to have a bearing on sufferers, so if your parents or other direct family this means that you can be more likely to be affected by it. However, I have found this isn't the case for me. No one in my family has eczema; I'm the only one. Biological factors can also play a big part in causing outbreaks and flare ups, these can include changes in hormone levels. Stress is not thought to be a cause of the condition itself but can certainly be linked to flare ups, the types of foods that you eat can also play a big part in the effects of eczema and chemical irritants found in household and bathroom products are also known to irritate the condition. My eczema flairs up when I'm stressed, when I eat dairy and if I use certain products either in my washing, while cleaning or even certain soaps. This is why so many companies including Sabai Soaps recommend using products which are 100% natural and do not contain any chemical ingredients, such as our natural soaps. 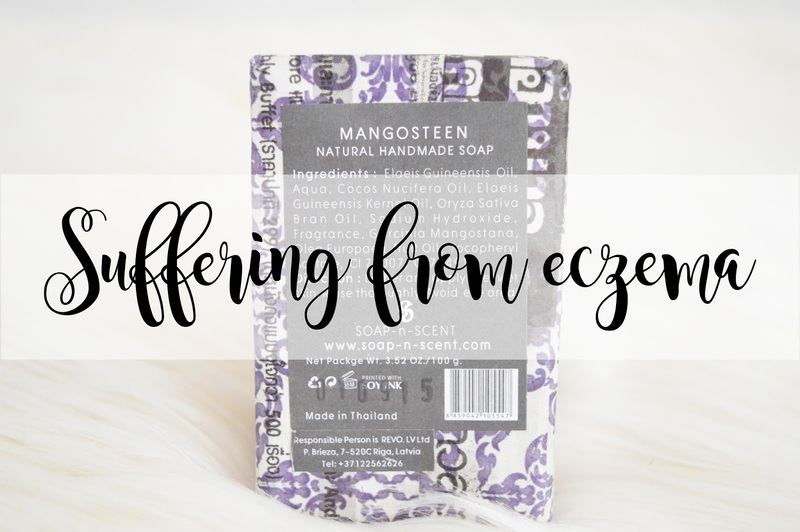 I personally recommend the Mangosteen soap as this has really helped the eczema which I suffer with on my hands. The most common symptoms of eczema are dry and scaly patches appearing on the skin which can be intensely itchy. However symptoms obviously vary per person. 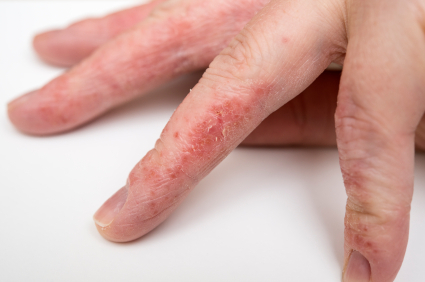 The level of eczema and its effects on a person can largely depend on how irritated the skin becomes. Scratching and itching will usually result in further irritation of the skin, increase inflammation and generally make the feeling of itchiness worse. I have found if I scratch where my skin is itching, I end up having bumps all over with my skin, scabs and bleeding. Plus if my skin is red, I find scratching makes the redness so much worse. “One of the easiest ways to calm eczema-prone skin is to adopt a gentle, non-irritating natural skin care routine and avoid harsh ingredients such as sodium lauryl sulphate which can damage the skin’s protective barrier and mineral oil, petroleum and paraffin wax which prevent the skin from breathing. If you’re struggling with a particularly bad flare-up you may want to consider going completely scent-free with your beauty routine as all fragrances, even natural essential oils, can sometimes be problematic for eczema sufferers. How can I get rid of eczema? what should I use for eczema? The best way to help eczema is moisturise! Eczema causes ridiculously dry skin and by moisturising at least three times a day minimum, not only will this reduce the immediate effects of the eczema, but in the long term it will create a protective barrier for your skin and in turn reduce the likelihood of future breakouts. If you want to try and minimise your eczema, you can try out the steps below! · Use a moisturiser straight after or use a moisturising soap during your bath to 'lock in' moisture. · Moisturise your skin every day, multiple times a day. · When washing use a natural soap or cleanser which doesn't contain any irritants. · After a bath or shower try patting your skin with your towel or air drying rather than rubbing it with the towel. · Where possible try to avoid excessive sweating and extreme changes in temperature. · Try to learn what triggers your eczema and then avoid them. · Keep you fingernails short, this will prevent ant potential itching causing the skin to break. Even though eczema itself is not directly curable, finding out what triggers your rashes and following some of the basic steps above can help to reduce its impact on your life. I have found after 18 years the trigger of my eczema is dairy and the more dairy I have, the worse my eczema is. It's definitely worth trying a food diary to see if this helps. Thank you to Gavin from Sabai Soaps for working with me on this post! If you have eczema, how do you cope with it?